Today - Tuesday, April 12 - New York City recognizes Equal Pay Day – a day to confront the challenges our mothers, daughters, and sisters still face in achieving workplace equality. Significant progress has been made, but substantial discrepancies exist between women and men – most notably, a sizable wage gap. As of 2013, women still earned only 78 cents for every dollar earned by men, with a median income over 27 percent lower than that of men. For women of color, the pay gap widens: black and Hispanic women earn 64 and 56 cents on the dollar, respectively. Stretched over a lifetime of work, this leaves women with much less money than the average man. At S&P Fortune 500 companies, women hold less than 5 percent of CEO positions and only 16 percent of board seats. When women are top earners, the pay gap tends to close at a faster pace. But disappointingly, the numbers show that women are vastly underrepresented in these higher-level positions, resulting in a persistent pay gap and lack of diversity in board rooms big and small. Yet, women are more educated and prepared for the workforce than ever before. Women now account for nearly 60 percent of annual four-year university graduates, 60 percent of master’s degrees, and 52 percent of doctorates being awarded in the United States. Though the longstanding pay gap is an undeniable social injustice; it amounts to much more, and is actually hurting corporate bottom lines. Study after study, particularly those from Catalyst, the global expert on accelerating progress for women through workplace inclusion, has stated that when women hold leadership or board positions, it improves company financial performance, economic growth, productivity, and profitability. This makes it crystal clear that business is better and companies perform most effectively when they bring equal opportunity, allowing everyone a seat at the table. The City of New York, as the global center of business and commerce, and proprietor of billions in private contracts, can play an important role in promoting the levels of diversity we need in the 21st century. Let’s make sure we get the best value for our own tax dollars, and promote businesses that promote equal opportunity. Last week, the City Council voted and passed Introduction 704-A, a bill we sponsored to gather more information on the gender and racial makeup of the individuals who make up executive-level staff and boards of companies that do business with the City. Once signed into law, it will require the Department of Small Business Services to survey companies that do business with the City and obtain the demographics of companies’ executive-level staff and board members. In 2015, the City procured $13.8 billion worth of goods and services through more than 60,000 transactions, yet we do not know who is running the companies that are conducting this business. Our new law will provide the City with the data it needs to ensure that city-contracted companies are promoting the diversity that makes this City so great, and could ultimately boost the economy. It’s a small step that we believe will go a long way to help our City recognize inequities in our own front yard and create incentives for businesses throughout New York to promote diversity in their top ranks. We hope you will all join us today in the fight for equal opportunity, equal pay, and a New York City where everyone can succeed. 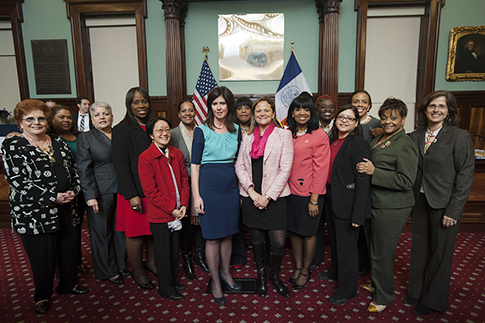 Elizabeth Crowley and Darlene Mealy are New York City Council Members; Deborah Gillis is President & CEO of Catalyst. City Council Member Maria del Carmen Arroyo recently announced she will resign at the end of the year in order to attend to family matters. In vacating her seat, which she has held since 2005, Arroyo creates uncertainty about who will represent her Bronx district, but also brings to the forefront a larger issue about political representation in New York City: the number of women in the City Council. The 51-member City Council currently consists of 15 women and 36 men. 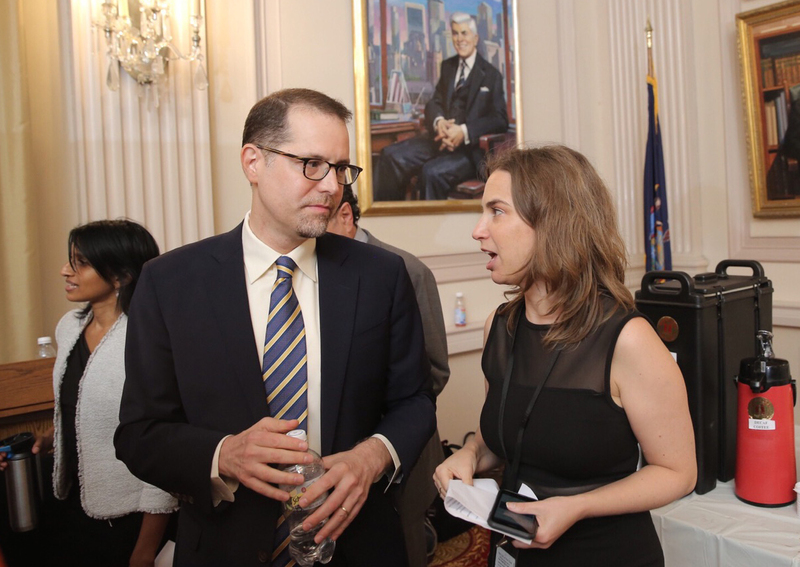 While the Speaker of the Council, Melissa Mark-Viverito, and chair of the powerful Finance Committee, Julissa Ferreras-Copeland, are both women, it is clear that the Council is not nearly representative of the general public when it comes to gender. The gender imbalance is of concern to Mark-Viverito, who is term-limited out of the Council at the end of 2017, Ferreras-Copeland, and many others - both inside and outside the Council, female and male. "The need for women's representation in elected office is unquestionable," Mark-Viverito said in a statement to Gotham Gazette. "As our society grapples with issues crucial to a woman's livelihood – including unfettered access to healthcare, equal pay for equal work, and educational parity – it's more important than ever that women are involved, invested, and leading these discussions." Several times over the past year, Mark-Viverito has made a point to publicly express her worry that the Council will have even fewer female members when the new class is inaugurated in January, 2018. Of eight Council members facing term-limits in 2017, five are women (the entire Council will be up for election in 2017; incumbents are virtual locks for re-election). "Women aren't naturally ushered into the pipeline of political leadership," says political strategist Alexis Grenell. "The role parties play in pipeline development is key to ensuring fair and equal representation...which means they have to be conscientious about their choices." Mark-Viverito, Ferreras-Copeland, fellow Council Member Helen Rosenthal, and former Council Members Gale Brewer, now Manhattan Borough President, and Letitia James, now Public Advocate, have all participated in "Why She Ran" events hosted by groups including The Working Families Party and Eleanor's Legacy, which are aimed at encouraging women to run for office. The events have been held over the past few years in locations all over the city and are often well-attended. At the most recent Why She Ran event, held Oct. 28 in Manhattan, Council Member Ferreras-Copeland said, "We need women in the City Council. I am here today to tell you we are in a crisis." She continued: "It will be an embarrassment if this Council loses more women after 2017." "We need you to run," Ferreras-Copeland told the audience of mostly women. "Even if you think you're not ready, you're ready." At this and other Why She Ran events, one statistic is frequently cited: on average, it takes seven asks to convince a woman to run for office. In her statement to Gotham Gazette, Mark-Viverito said, "New York City is ready for the next generation of strong women leaders, at all levels of government. We need to do everything we can to amplify these voices and ensure that women trailblazers have the tools and platform to make a difference." Attendees of Why She Ran are encouraged to hear from local elected officials about "the challenges women face in politics — and the importance of tackling those challenges head on." Chief among those challenges are confidence and fundraising, participants say. Essential to the process is often also cracking the "old boys club" of local politics. "The lack of gender balance is alarming," Council Member Ritchie Torres told Gotham Gazette. "You know, there are various senses in which the City Council is more progressive. We have more LGBT people in the City Council, we have more young people in the City Council, we have a strong caucus of black, Latino and Asian members. The one sense in which we have been regressing is the number of female Council members to the point where I would regard it as a crisis...and a poor reflection on the City Council." The 2013 city elections saw a net loss of one female Council member - the prior Council included 16 women and 35 men. While he said gender should never be the lone deciding factor in supporting a candidate, Torres pointed to the fact that "people are a product of our life experiences and we bring those experiences to bear on our governance of the city or the state or the country." "It's no accident," he said, "that the more women you have in politics, the stronger the commitment to addressing deeply rooted problems that might affect women disproportionately." Mark-Viverito pointed to the importance of women in elected office during a summer speech at the Young Women's Leadership School Commencement. "The more involved I became, the more I realized that the systemic issues of social and economic justice we battle on the ground in our communities was something we needed to address at the government level, and I knew my perspective could make a difference there as well," she said. "Because women play pivotal roles in our families, in our communities, and in government," Mark-Viverito said, "our perspective is crucial. We get things done." 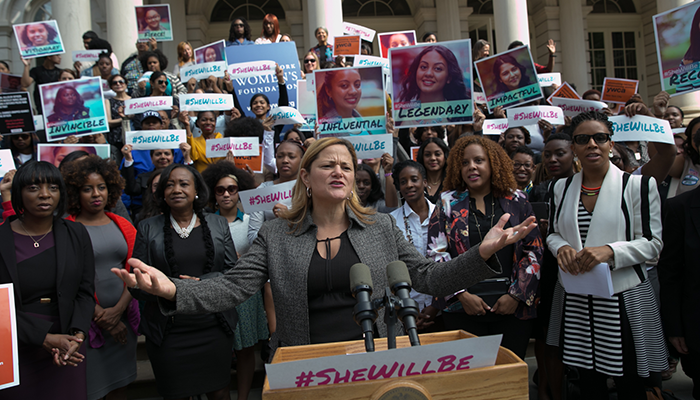 In October, Mark-Viverito and the Council launched the Young Women's Initiative, a coalition of public and private sector leaders and organizations, "aimed at supporting young women in New York City and combating chronic racial and gender inequality in outcomes when it comes to healthcare, education, involvement in the justice system and economic development." In the special election to replace Arroyo, set to occur on a date to be determined in February, there are several rumored and confirmed candidates, including at least two women. One crucial aspect to the race will be the backing of the Bronx County Democratic Party organization - the chair of which is Assembly Member Marcos Crespo, who recently replaced new Assembly Speaker Carl Heastie. Grenell, the political strategist, points to research showing that, particularly in special elections, establishment support correlates highly with outcomes. Grenell says that balanced gender representation "absolutely should be a priority of county organizations." "Part of developing a pipeline of strong female leadership is parties looking for and cultivating qualified female candidates for office, not defaulting to whoever's 'turn it is,'" Grenell says. Pointing to a looming "crisis in female leadership in the Council," Grenell says "if county leadership doesn't prioritize female leadership it will compound the problem going into 2017." "This is not a cosmetic issue," Grenell warns, "women in government prioritize different issues than men, and we see different outcomes."